The forearm pass or dig is used to play a ball that is coming below head height, so it cannot be volley or a ball which is traveling a a great velocity. This technique is implemented by bringing the forearms together to make a platform, off which the ball rebounds. The forearm pass is most often used to receive the service or opponents attacking shot. Successfully Mastering the Forearm Pass. 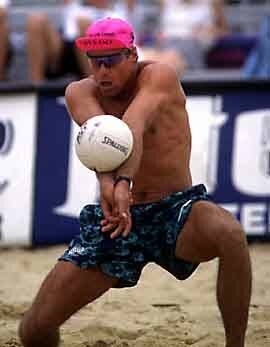 As with the volley, you must adopt the ready position. It is important to firstly decide whether to go for the ball and then call for it and move to the ball. You should then stop before playing the ball. The contact of the ball takes place in the mid line of the body. The hands are together and the elbows are straightened and locked. This will enable the player to form a platform for the ball to hit. The ball is contacted on the forearms just above the wrist.